rings | All About Jewelry! This Jewelry Blog site is the bee's knees!! Recently Gemfields showcased a wealth of jewelry at the Couture show, displaying pieces from designers who incorporate Zambian emeralds, Mozambican rubies and amethysts from the Gemfields mine into their designs. Hoorsenbuhs, Zaiken, Shaun Leane, Stephen Webster, Wendy Yue and Theo Fennel are among the designers that collaborated with Gemfields, which opened its U.S. offices last September and named well-known actress Mila Kunis as its brand ambassador in February. Post trade issues with the Zambian government, Gemfields still unshaken by its issues, manages to put out some of its finest works. Below are some of Gemfields brighter outlook from some of its best designers. 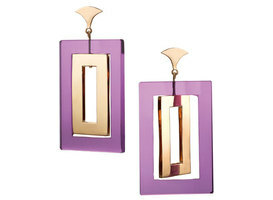 These 18-karat yellow gold earrings from designer Kara Ross feature 50 carats of Zambian amethysts ($4,200). 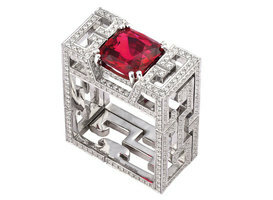 Dickson Yewn’s 18-karat white gold ring with a 4.01-carat Mozambican ruby and diamonds ($64,800). Hoorsenbuhs’ 18-karat yellow gold cuff features 7 carats of Zambian emeralds ($75,000). 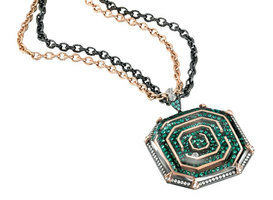 Zaiken’s 18-karat rose gold and sterling silver necklace with 5 carats of Zambian emeralds and diamonds ($29,500). 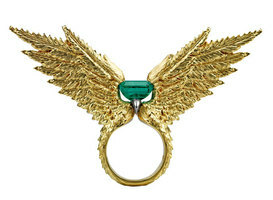 Jasmine Alexander’s 18-karat yellow gold and platinum ring with a 3.85-carat Zambian emerald (approximately $50,648). Happy new year all, As some of us may have known in Chinese astrology 2013 is the Year of the Snake. Fortunately for some of us in the jewelry industry, jewelry inspired by this mysterious slithering creature has been trending lately. 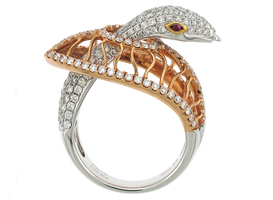 While rings have an allure to be the most popular item created for their mass depiction, many designers have successfully wound the serpent into beautiful earrings, necklaces and even eye-catching bangles and bracelets. These accessories coupled with colorful gemstones often play the part of the reptile’s small beady eyes, and scales are defined by diamonds or metal texture. Although an animal plagued by superstition and negative connotations within numerous religious genres, a piece containing a snake would make an excellent addition to anyones jewelry arsenal. If your not swayed, i’m sure some of the featured pieces from the designers or jewelry houses below will help you make that decision. This ring can be purchased here. 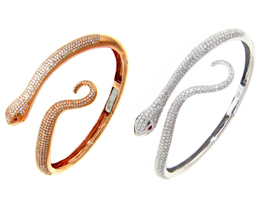 Michael John Jewelry’s snake bangles, made in (from left) 18-karat rose gold with round brilliant diamonds and rubies ($16,150) and 18-karat white gold bangle with round brilliant diamonds and rubies ($16,150). 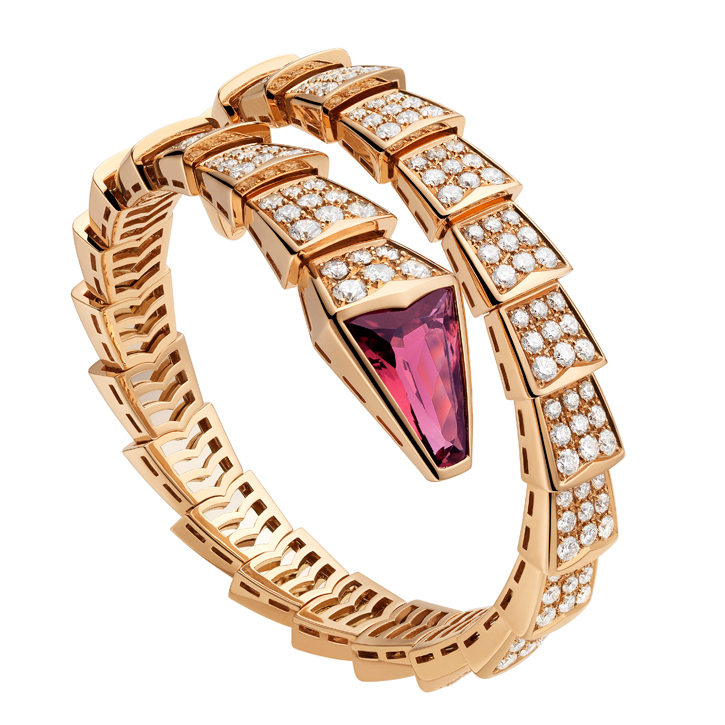 Bulgari Bracelet SERPENTI 18kt rose gold with pave diamonds. 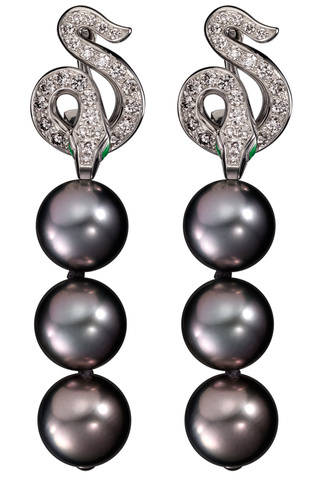 Boucheron snake earring in 14kt white gold accented with pave diamonds and dropped black pearls. Which can be acquired here. Enter email address to follow this blog and be notified of new posts by email.